Click here to check program errata. 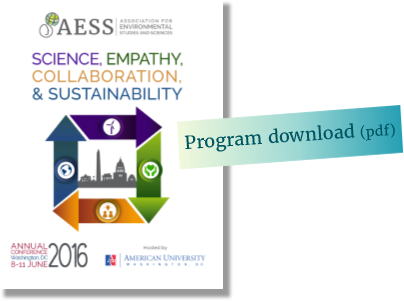 The conference theme will allow AESS to showcase its interdisciplinary strengths on this vitally important topic, including such issues as problem-solving through multi-disciplinary data and analysis, multiple perspectives, team building and collaborations, and future-oriented teaching across disciplines. In addition, the theme and location of the conference offer a chance to consider multi-scale policy making at local, city, state, regional, national and international levels. Proposers are encouraged to take advantage of the DC location and include NGOs, government agencies, international institutions as well as local governments and organizations in your proposed session. How to integrate the best information from humanities, social sciences, and natural sciences in developing understanding and effective solutions to address serious environmental problems? How can interdisciplinary fields such as Environmental Studies and Environmental Sciences contribute effectively to these endeavors? How to improve our understanding of what sustainability actually means, and how can we design a more robust pedagogy to ensure that the idea of sustainability becomes a best practice? Environmental consequences affect physical and human systems, including diverse stakeholders and issues of equity and social justice. What perspectives help us address these questions across different viewpoints and value systems? How can environmental issues be communicated to all necessary audiences? What case studies represent success stories or best practices with wide applicability? What collaborations have been most effective at different scales, from local to urban, state, region, national and international? What are the differences in approaches for different environmental challenges (e.g., local air pollution, water availability and quality, global climate change, land use)? 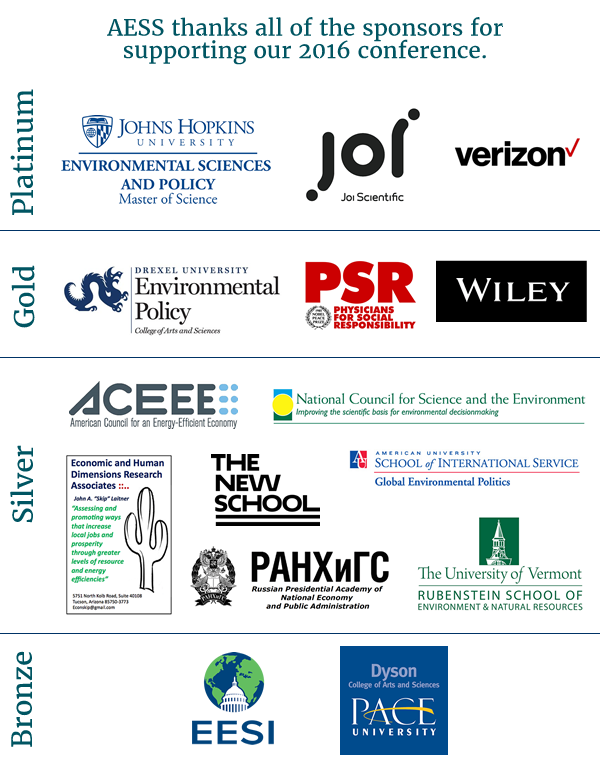 What roles can faculty and students play in understanding, communicating, and addressing the range of environmental challenges, within and across educational institutions, and in interacting with private and public institutions including various government entities? How can we partner with communities, governments, NGOs, the media, to generate more effective frameworks and solutions? Please address all questions to conference@aessonline.org.